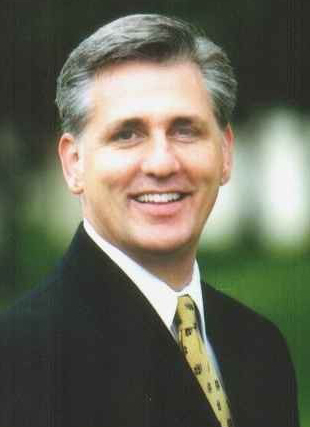 Bakersfield Rep. Kevin McCarthy, House Majority Whip, gives us his weekly view from Capitol Hill. "I want to congratulate Bakersfield High School senior Amelia Egland for winning the 2011 Earl Warren Cup competition Wednesday night. 32 students competed in the 6th annual competition, and I want to say a job well done to all the participants and also to Principal David Reese, whose impressive entrance from the ceiling kicked things off. This is exactly the kind of competition that can get students excited about government, politics and civic responsibility, and I want to thank Jeremy Adams, Pam and Kevin Reynier and Craig Holliday for making it such a successful competition. When I reached out to First Lady Laura Bush, Diane Sawyer, Speaker Boehner and others to ask them to record a question for the competition, they were all happy to participate. Knowing our community is full of so many bright, passionate and driven young people makes me confident that America’s best days are still ahead. "But we must do our part to ensure that the America our children inherit is still a strong one. There are more than 20 bipartisan jobs bills passed by the House lingering in the Senate waiting to be voted on, and we added three more this week. The Workforce Democracy & Fairness Act (H.R. 3094) protects employers and employees from partisan overreach by the National Labor Relations Board (NLRB), the Regulatory Flexibility Improvements Act of 2011 (H.R. 527) modernizes regulations that haven’t been changed in fifteen years and the Regulatory Accountability Act (H.R. 3010) establishes a rational system of cost-benefit analysis and increases the transparency of rulemaking and public hearings of proposed rules. These common-sense bills could help increase the confidence of our job creators to grow jobs at a time when millions of Americans are seeking work, and I will continue to push Senate Majority Leader Harry Reid to bring them to the Senate floor. Increasing certainty about our water supply is also vital, especially here in the Central Valley. Next week, I will be sending a letter to Interior Department Secretary Ken Salazar demanding that his Department use the best available science when they begin work on the new Sacramento-San Joaquin Delta delta smelt biological opinion. Recently, a Federal court struck down the existing opinion, which is cutting off vital water supplies to California’s Central Valley, as unlawful and not based on the best science. The court ordered it to be redone. The court also discredited some of the scientists who wrote the existing opinion, but unfortunately the Interior Department continues to stand behind them. In order to ensure the best available science is used, the letter also calls on the Secretary to replace the discredited scientists. "Water is the lifeblood of our community and economy. When a Federal court throws out a Federal agency biological opinion because of shoddy science, it is incumbent upon that agency to improve the science behind it – both for its own credibility and for the millions of Californians who depend on water coming through the delta.